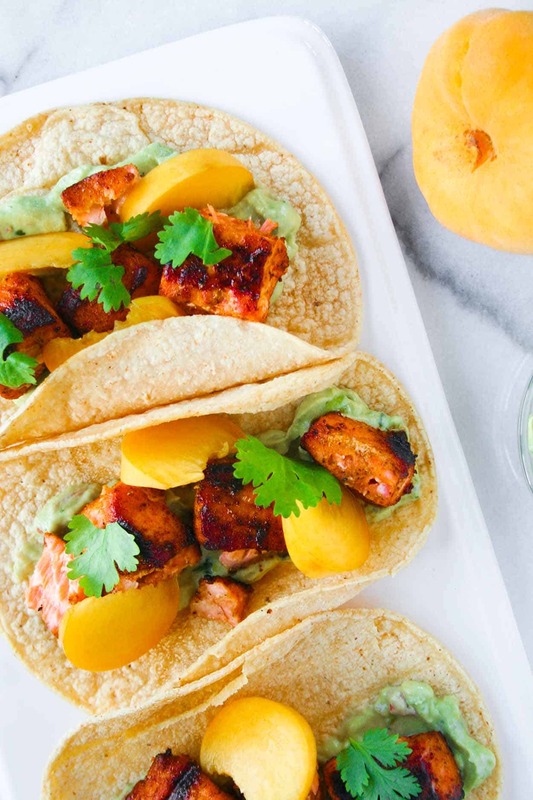 These blackened salmon tacos take spiced, skewered, and grilled salmon paired with avocado, fresh mango, pickled onions, and cilantro to create the perfect Cinco de Mayo recipe! It’s week 4 of TACO MONTH on Hungry by Nature and I am ready!! 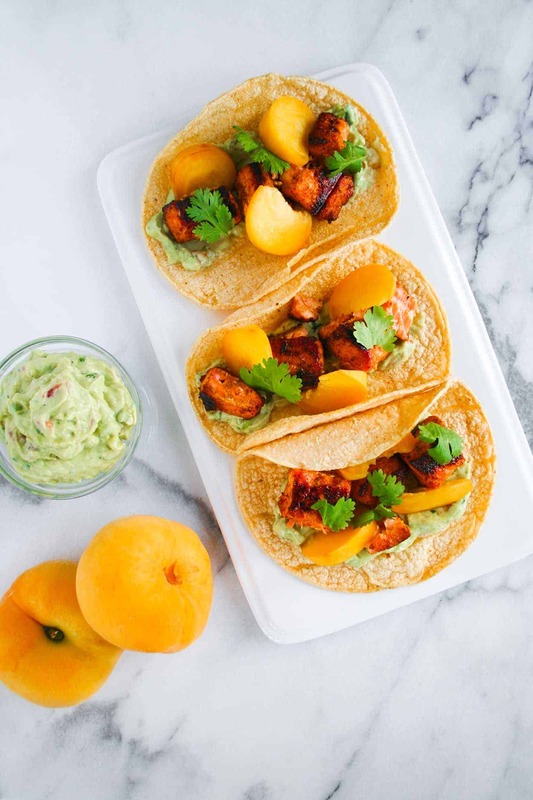 As I mentioned the last few weeks, I am going to be sharing recipes all month long to get you ready for Cinco de Mayo – because HELLO tacos are life and any holiday that gives me another excuse to eat them is a winner in my book. My love for salmon runs deep. My love for tacos runs deeper. And together, blackened salmon tacos are everything. 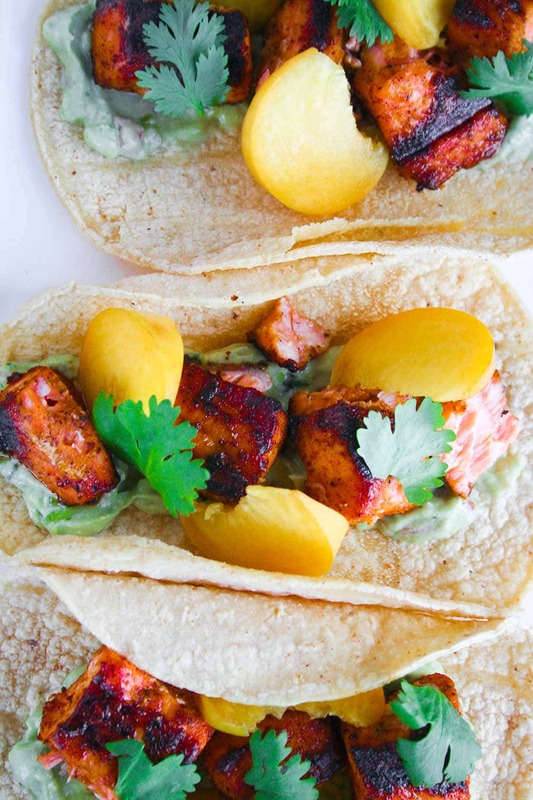 These blackened salmon tacos come together in a snap, thanks to a short (but spicy!) ingredient list. Spices: I did a mixture of cumin – my all-time fave spice, smoked paprika, onion powder, chili powder, salt, and pepper. And I guarantee you have all of those spices in your spice drawer. Corn Tortillas: I opted for corn for this recipe because I love getting a really good char on them. 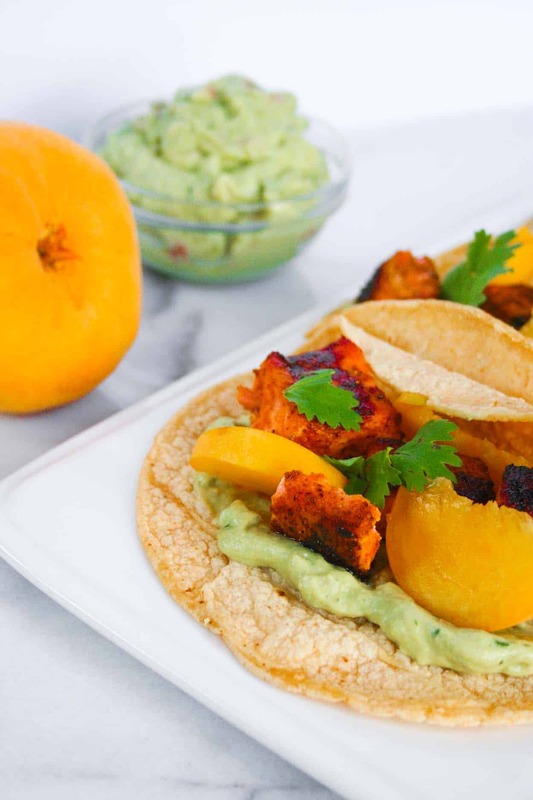 But you could always make my almond flour or cassava flour tortillas! 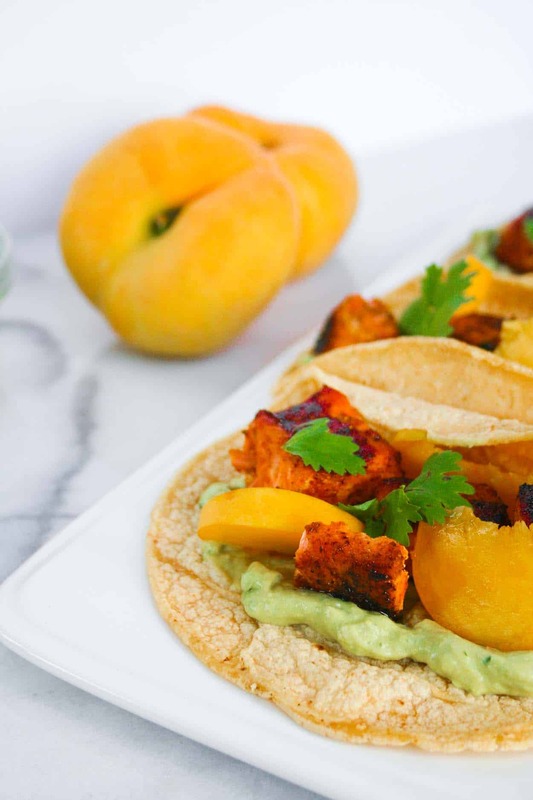 Mango: Adding a sweet fruit like mango, pineapple, or sliced peaches offsets the spice mixture. Avocado: Again, does this need an explanation?! Avocado and tacos were made for each other. Cilantro and picked red onions: I love topping my tacos with both cilantro and pickled onions for extra flavor and texture! In addition to a simple ingredient list, making these blackened salmon tacos couldn’t be easier! First make sure you soak your skewers (if yours are wood) and preheat your grill. 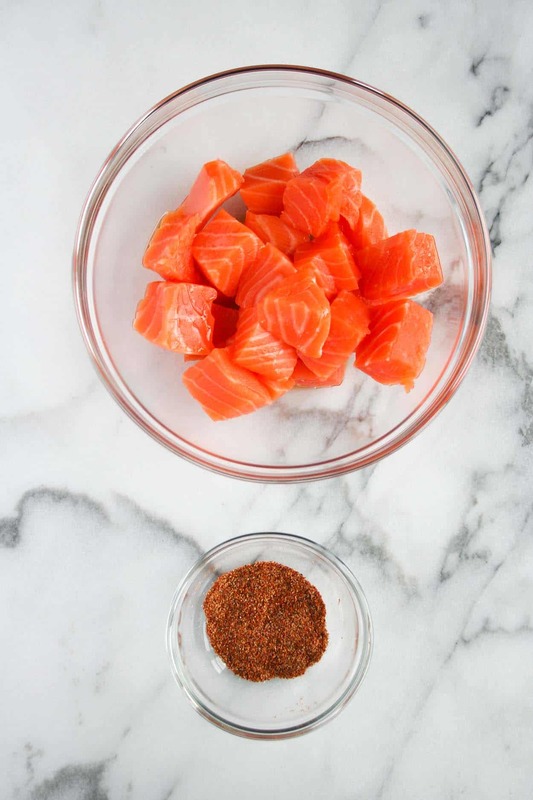 Combine all the spices in a bowl and toss over cubed salmon. 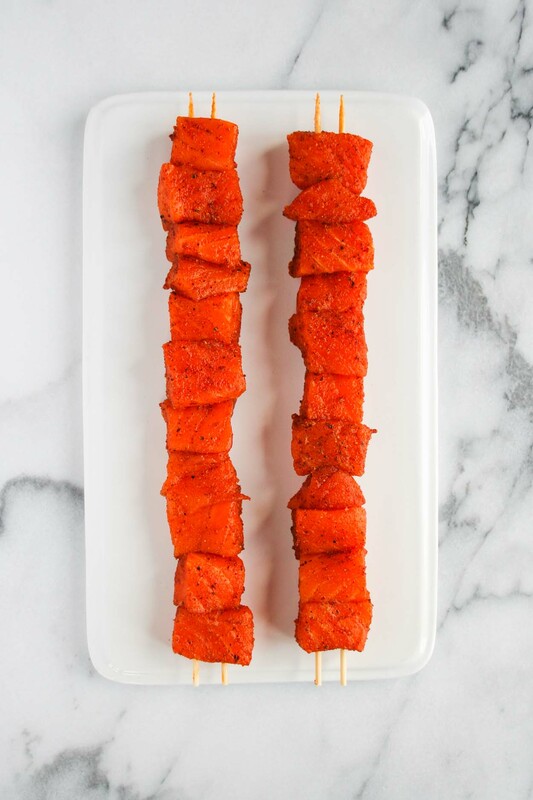 Using two sets of skewers, skewer salmon cubes (using two skewers per set helps keep the salmon in place). Using tongs, wipe an oiled paper towel over the grates of the grill to prevent the salmon from sticking. 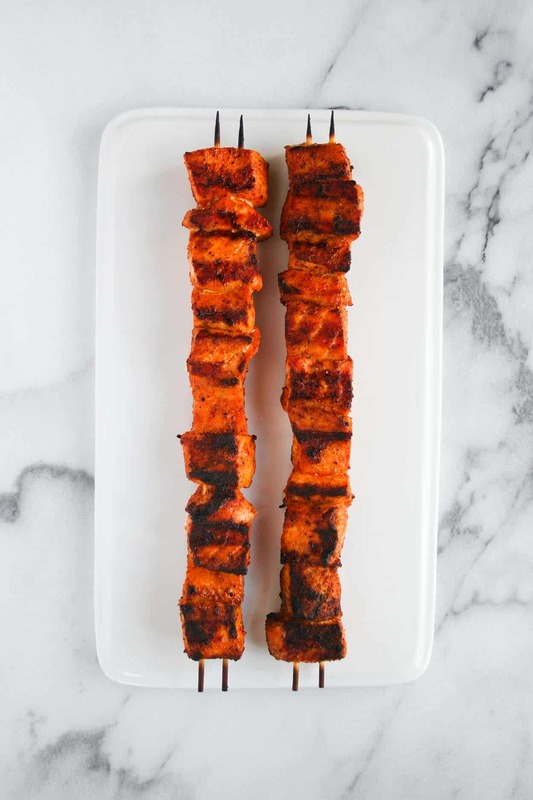 Place skewers on the grill (medium direct heat) and cook for 5 minutes on each side. While the salmon is cooking, prepare your other ingredients. Heat or char your tortillas. Slice the mango and avocado. And grab your cilantro and pickled onion! When the salmon is done, remove it from the skewers, assembly your tacos, and enjoy! If grilling is not an option for you, you could always cook the salmon inside on a grill pan (this is the one I have), bake the salmon for about 15 minutes at 400 degrees, or even cook on the stovetop! I know you are going to LOVE these blackened salmon tacos!! When you make them for Cinco de Mayo, post a picture on social media and use the hashtag #imhungrybynature so that I can see! Pin this recipe for your Cinco de Mayo celebration or your next Taco Tuesday! This sounds so good! I am a lover of salmon and anything in taco form is a winner for me! You and me both Kelly! Sometimes I get concerned with the amount that I eat… at what point should I be concerned with mercury levels?? Oh em gee fish tacos are probably one of my favorite things ever. I love that rub on the salmon! Everything about these looks so perfect! Right?! There is nothing better – thanks Ashley! Ohhhh my! I am in love! LOVE I tell you! YES!! When my husband ate these, he said it was one of his favorite things I’ve ever made! Gahhh that perfectly charred salmon is majorly bringing on the drools over here. I still need to get my hands on these dang donut peaches, too! Lol SO delish, girl!! I need these in my life ASAP! <3 I love peaches and salmon, so this combo is perfect in my book! :]! Yayyayayay! You will LOVE these Farrah – thanks! ughhh those salmon chunks look absolutely PERFECT. I need to make myself a jar of that cajun rub and just have it handy for stuff like this. Can’t wait to move to my new place and get a BBQ too! just as summer is ending… great timing hah. pinning this! Thanks Bev! For how much I make this salmon, I really should have the rub pre-mixed and ready to go! Congrats on buying a place – I cannot wait to see pictures. We bought our condo last year and if feels so good to own something it also forces you to take care of it – ha! Thanks for the pin! Yum! Tacos are my absolute favorite too. I bet these same spices would be great with Tofu too! I bet you are right! If you try it with tofu – let me know how it goes! you are speaking my language with these tacos. i am thinking that rub would be perfect for grilled shrimp tacos too ? funny how in some places it is too hot to cook inside, & when it is grilling season everywhere else it is too hot to cook outside here. i only will smoke things during the day in the summer, grilling has to be done in the early morning or evening when the sun is not able to incinerate you standing with your face over a blazing hot grill. ummmm YES. Now I want to go home and make cajun shrimp tacos – genius! Where do you live that it’s so hot?? And now I understand why you cannot grill in the summer! Dang it is HOT there. haha you said it girl. nothing keeps me from my grill though, just have to be more strategic about it this half the year.. or plan poorly & suffer for your art, which i have also done plenty of times ? Well, I’ve already saved this recipe to Pinterest for later. Wow! These look and sound amazing! 🙂 I love fish tacos, but haven’t had salmon tacos yet. The cajun seasoning with the juicy peach sounds like an awesome combination. Thanks for sharing! Thanks Britney!! I could literally eat fish tacos everyday – something about them is just so dang good! Let me know when you give the recipe a try! These look so good! I love combining fruit and proteins. Can’t wait to try these! Thanks Jessica! This has been one of my favorite recipes to date – let me know how you like them! !